No need for me to travel far to raise my awareness concerning breast and cervical cancer. 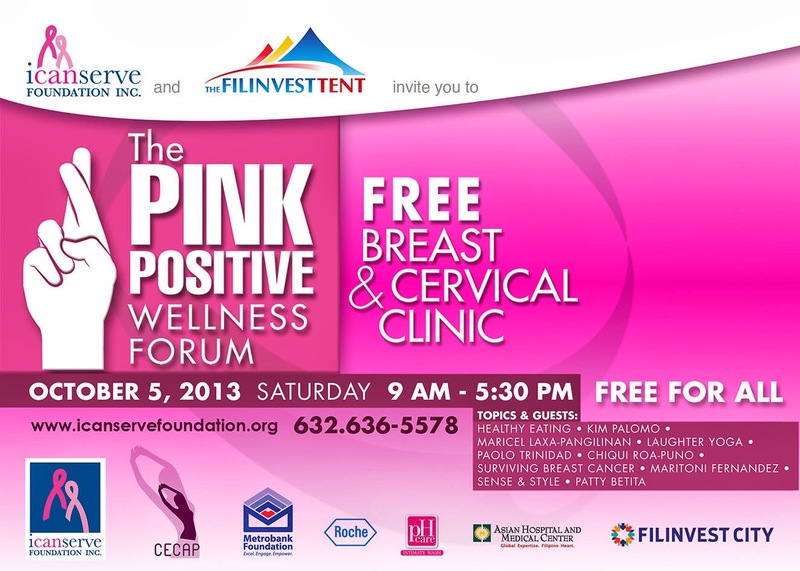 The Pink Positive Wellness Forum is coming in the South this Saturday. A big thanks of shout out to my sister for sharing this info. I couldn't remember the last time I had my pap smear. I think it was last year of June or July. With regards to my last breast examination, I'm guessing that it was two years ago during the annual physical examination. I know I should be very vigilant in having my checkups. It's a no joke that many people are dying from cancer, men and women alike. I have to make an extra effort tomorrow and grab the opportunity to have myself check this Saturday since there's a clinic on the event. Sweet! I think every women, single, married, separated or widowed should attend this forum. 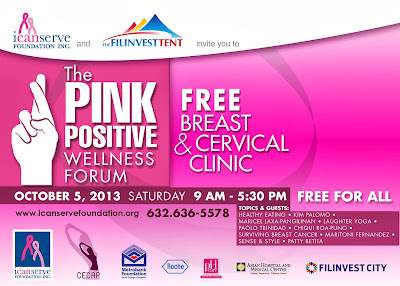 It's a must that we equipped ourselves with knowledge about breast and cervical cancer and how to deal with it. Congratulations to I Can Serve Foundation for organizing this event. 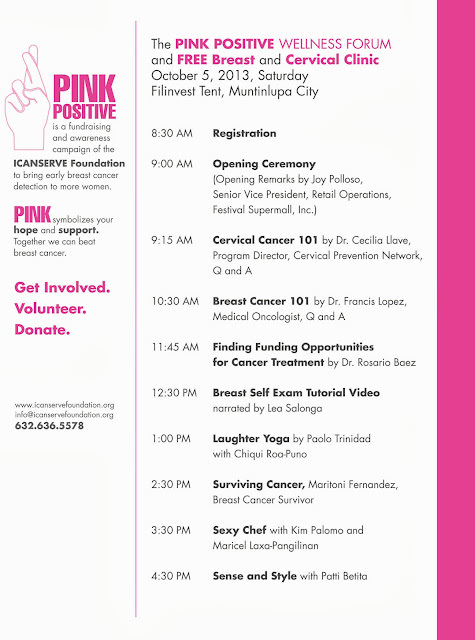 Lea Salonga and Dawn Zulueta are some of the celebrities whose taking part of the foundation's advocacy to spread awareness and educate people about these deadly cancers that's affecting the lives of women across the globe. To know more about the foundation, please do visit their website. You can check out their gift items sold online. 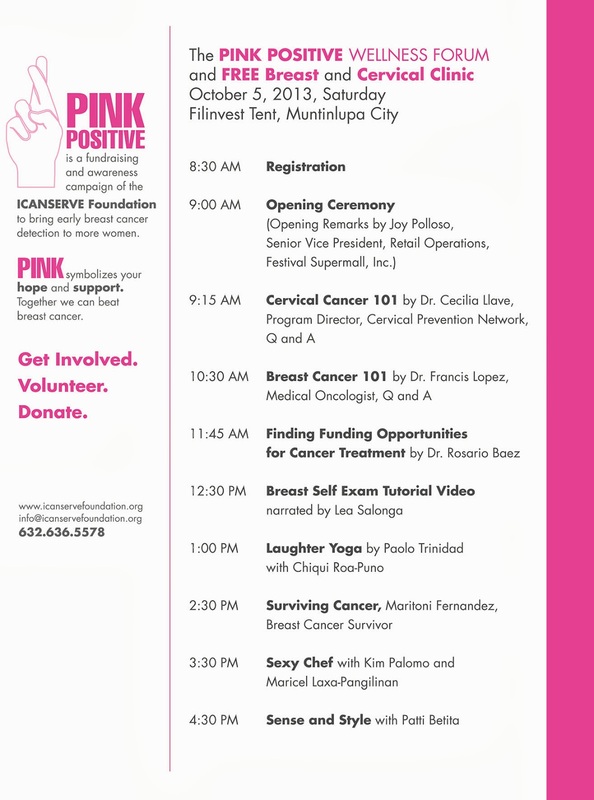 Proceeds will help subsidize the medical care for breast cancer patients undergoing treatment. If you don't fancy anything on their goods, donation is also welcome or you can also be a volunteer. I Can Serve Foundation, Inc.